In January 2010, a trial excavation was conducted at Giv‘at Kaizer in Modi‘in (Permit No. 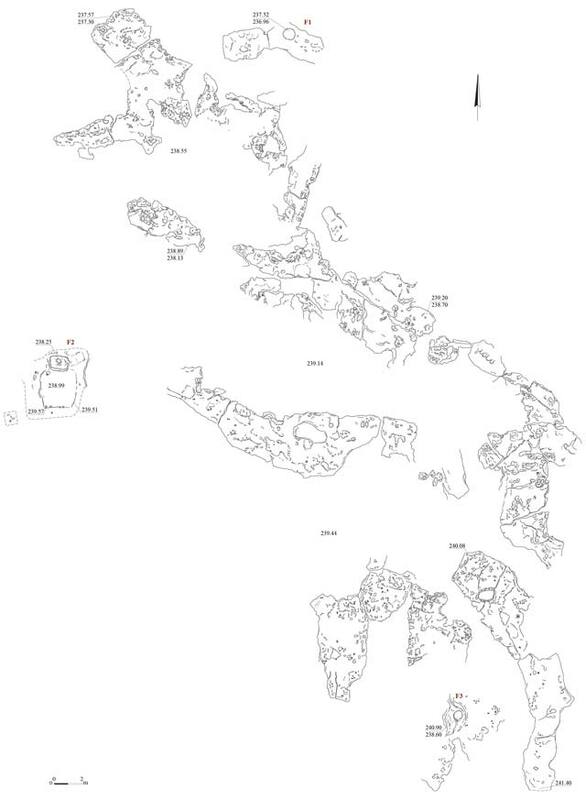 A-5814; map ref. 19928–31/64565–70). 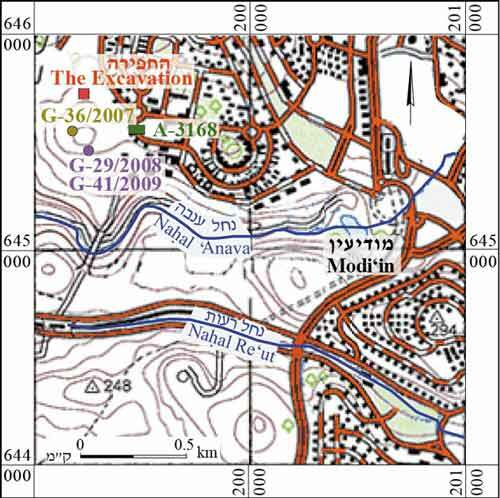 The excavation, undertaken on behalf of the Israel Antiquities Authority and financed by the Ministry of Construction and Housing, was directed by P. Spivak, with the assistance of S. Ya‘aqov-Jam and E. Bachar (administration), T. Kanias (antiquities inspection), O. Marder (consultation), M. Kunin and T. Kornfeld (surveying and drafting), S. Ammami and the Sky View Company (field photography), A. Dagot (GPS) and N. Zak (plans). The first survey and excavation that were conducted at Giv‘at Kaizer, documented remains of activity ascribed to the Pre-Pottery Neolithic A (Zbenovich 2006 Fig. 1: A-3168). An ancient flint quarry was documented in subsequent excavations on the hilltop and the western slopes (Herzlinger, Grosman and Goren-Inbar 2013; Fig. 1: G-36/2007, G-29/2008, G-41/2009). In the current excavation, on the northwestern slope of the hill, four rock steps with cupmark-like depressions were documented. The depressions were apparently formed when chunks of flint were quarried,. Flint items dating to the PPNA were collected from the surface. A simple rock-hewn winepress, a shaft and a basin were also documented. Installations. The winepress (F2; Fig. 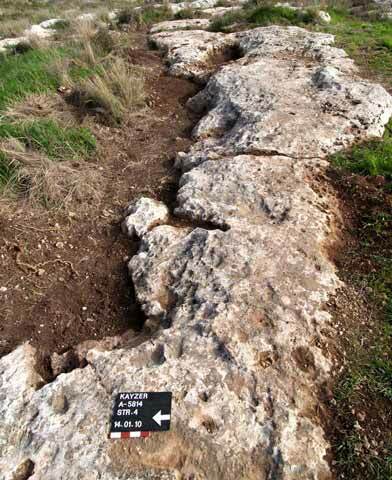 2) was rock-hewn and consisted of a shallow square treading floor, slanting slightly toward a square collecting vat. The excavation of the shaft (F3; diam. 0.4 m, depth in excess of 2 m), which was partly natural and partly hewn, was not completed. The basin was circular (diam. 0.5 m, depth c. 0.5 m) and rock-cut. Flint Items. 2,639 flint items (c. 80% chips and chunks, and c. 20% flakes) were found on and between the rock steps. The assemblage included several blades (0.3%), cores and core trimming elements (c. 1%), tools and tool fragments (c. 1%). Noteworthy among the tools are the bi-facial axes and their fragments (60%), of a type that was widely used in the PPNA. Evidence of Ancient Quarrying. Numerous cupmark-like depressions in different sizes were identified on the rock steps and along their edges (Fig. 3). Similar cupmarks were documented in nearby excavations (Grossman and Goren-Inbar 2010), and marks of quarrying flint chunks from the soft nari which is exposed on the surface were identified in them. The flint chunks were used to produce axes, which showed breaking patterns that indicate intensive use. Installations devoid of any datable finds were exposed. Many similar winepresses were documented alongside hewn installations in the Modi‘in area (Spivak 2012, and see references therein), and in most instances it was not possible to date them or ascribe them to a specific settlement. Presumably, most of these winepresses were within the boundaries of the agricultural hinterland of the many ruins scattered along the rocky hills in the Modi‘in area (e.g. 'Ad 2011). Flint concentrations from the PPNA are common in the vicinity of Modi‘in (Spivak 2012, and see references therein). The most common lithic items in these assemblages are bifacial axes fashioned with transversal blows, a technique characteristic of the period. The tools were generally made of indigenous flint. The documentation of the quarrying marks and an analysis of their patterns contribute considerably to the research of the Early Neolithic period. ‘Ad U. 2011. Modi‘in, Khirbat Abu Fureij (Northwest). HA-ESI 123. Grossman L. and Goren-Inbar N. 2010. Evidence in the Rock—A Neolithic Quarry on Giv‘at Kaizer, Modi‘in. In D. Amit, O. Peleg-Bareket and G.D. Steibel (eds). Innovations in the Archaeology of Jerusalem and the Surrounding Area. Volume 4, pp. 40–49 (Hebrew). Herzlinger G., Grosman L. and Goren-Inbar N. 2013. The PPNA Quarry of Kaizer Hill, Modi‘in, Israel—the Waste Piles. In F. Borrell, J.J. Ibáñez and M. Molist eds. Stone Tools in Transition: From Hunter-Gatherers to Farming Societies in the Near East. Barcelona. Pp. 395–406. Spivak P. 2012. Horbat Kelah (B). HA-ESI 124. 3. A rock step with a range of quarrying marks, looking east.